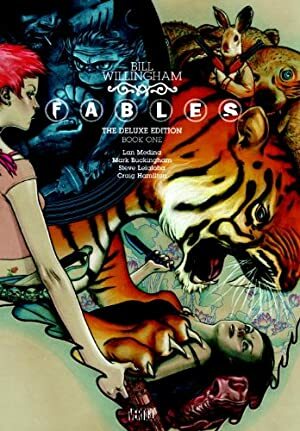 Fables was a 2002-2015 comic book series (plus spin-offs), chiefly associated with writer Bill Willingham. 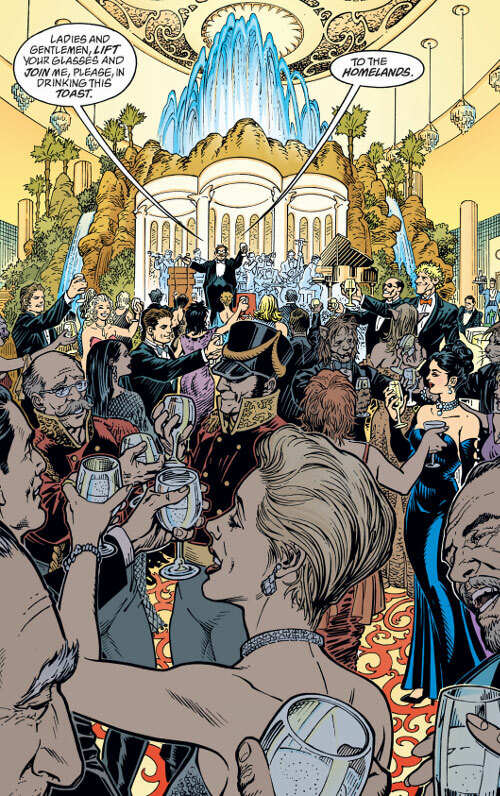 The early volumes are well-regarded, and are one of the main DC Comics fantasy series of the 2000s. Fables is based on the characters and other elements from fairy tales and folk tales coming to the real world to flee an invasion. They found covert communities to escape detection, and try to get along and rebuild their lives as refugees. 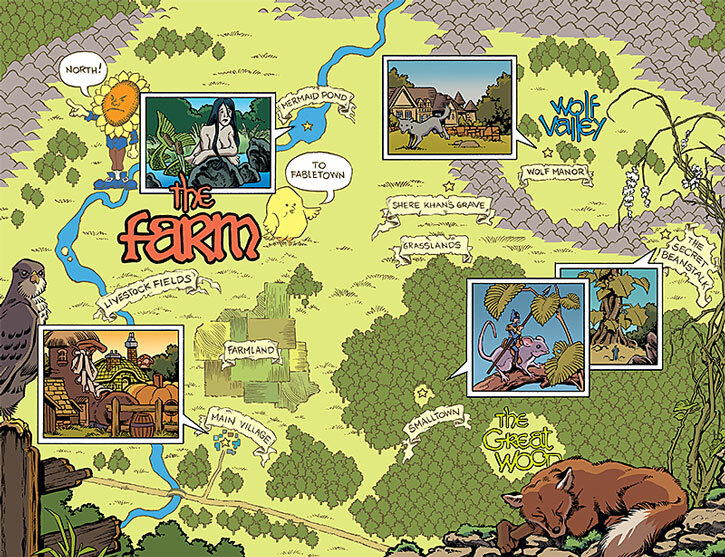 The stories are centred around Fabletown, one of the largest communities of fables folks. 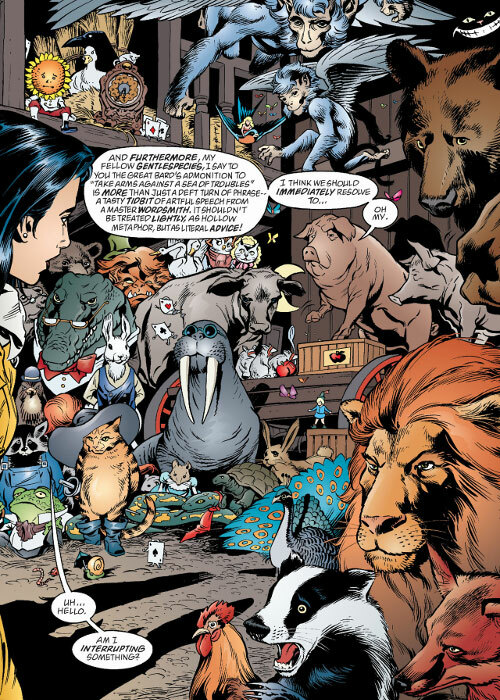 This profile serves as a “base camp” article, to prevent repetition of information throughout the individual character profiles for the Fables. It contains S P O I L E R S for the storylines. A haven for refugee fables who fled the Empire’s growth in the Homelands. Maintain secrecy as to its residents’ true natures. New York, with agents worldwide and on other worlds. Fabletown, Bullfinch Street, New York City. Fabletown is ruled by a Mayor, who’s aided by a deputy mayor and various other functionaries, and a sheriff who oversees security. The Farm, while technically part of Fabletown, has its own administrator. Too many others to list (at least hundreds). More others than can be listed. Any fable who signs the Fabletown Compact. Once upon a time the storybook lands fell under the sway of a dark empire. During the centuries of its rise to power, as it conquered world after world, many fled in search of refuge. Many reached the mundane world, whose lack of magic made it of little interest to the Emperor. He ignored them, having more interesting lands still to conquer. The fables now living in the mundane world banded together. They forged a Compact so as to put aside past grievances. They established a small settlement near New Amsterdam, which later became part of New York as the city grew around them. It became known as Bullfinch Street to the mundane (“mundy”) world. The sorcerously gifted among them crafted enchantments to discourage mundys from paying attention to Fabletown or its residents. But they still had to buy farmland upstate to which to relocate the non-human fables. This wasn’t popular with those forced there. While technically a democracy, King Cole became Mayor early on, and his role was rarely challenged. Ichabod Crane served as his deputy until his misconduct in recent times. Crane’s assistant, Snow White, took over. She functionally ran Fabletown. 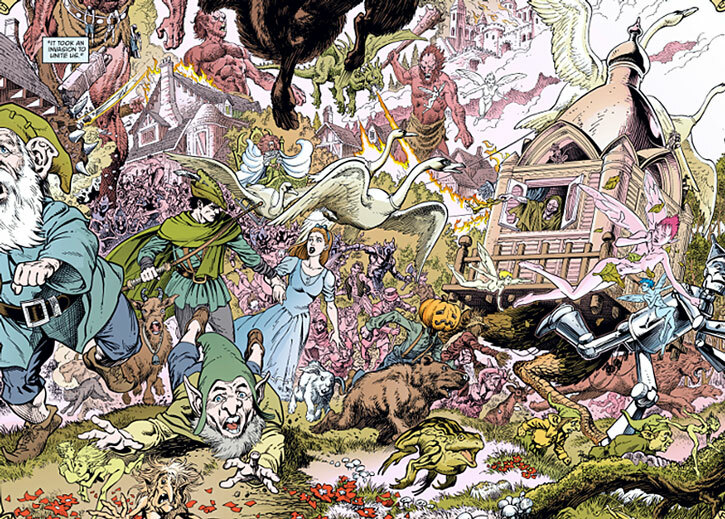 Fabletown continued in relative peace for centuries. But discontent simmered among those who dreamed of retaking the homelands, particularly among those confined to the Farm. This unrest was taken advantage of by Goldilocks, who fomented a coup on the Farm. It coincided with Snow escorting her sister, Rose Red, there to carry out community service for her crimes. The Farm’s administrator, Wayland Smith, had already been taken prisoner. He was forced to convert modern weaponry into forms usable by the animal fables. Warned by loyal fables, Snow avoided capture while Rose pretended to join the revolution. After freeing Wayland, Snow woke the larger Farm residents: a dragon and giants who’d been put into a magical sleep centuries before. With their aid she soon subdued the revolution. Goldilocks fled, but not before shooting Snow in the head. It took Snow months to recover. Then she again became the victim of Goldilocks’ manipulations, along with those of Bluebeard. Snow and Bigby survived Goldilocks’ attempt on their lives, temporarily disposing of her. Meanwhile the recently returned Prince Charming killed Bluebeard in a duel. Bluebeard’s vast treasuries became Fabletown’s. As a result, Prince Charming challenged King Cole’s mayorship to seek control of the treasure. The first new refugee from the homelands in centuries aroused excitement in Fabletown. However, Red Riding Hood turned out to be Baba Yaga in disguise. An agent of the Emperor, she led an army of wooden soldiers in trying to conquer Fabletown and seize its magics. They failed, though not without cost. But it had become obvious the Empire was no longer content to ignore Fabletown. Prince Charming won the mayoral elections largely by the support of the animal fables. He had promised enchantments to any who wanted to pass as human. Having neglected to check with the witches of the Thirteenth Floor that this would be possible, his governance didn’t get off to a good start. Since Snow and Bigby refused to work with him, he needed a new deputy mayor and sheriff. Charming hired Beauty and Beast to replace them. 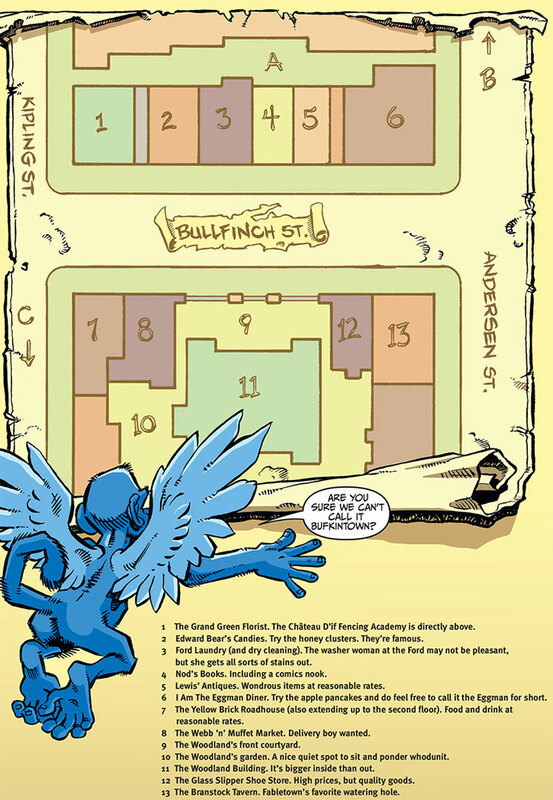 Soon after the invasion, Boy Blue disappeared with some of Fabletown’s most powerful magics. He’d returned to the Homelands to search for the real Red Riding Hood. Boy Blue had been close to her before fleeing the Homelands. Boy Blue was officially punished for his crimes on returning (with Red Riding Hood, though not the one he’d known). But he actually received Prince Charming’s blessing to gather intelligence on the Empire. As they’d suspected before he left, the Adversary proved actually be Geppetto. Blue had also taken the remains of his friend Pinocchio with him. Geppetto had brought him back to life, but with added loyalty enchantments, so Pinocchio stayed with him. 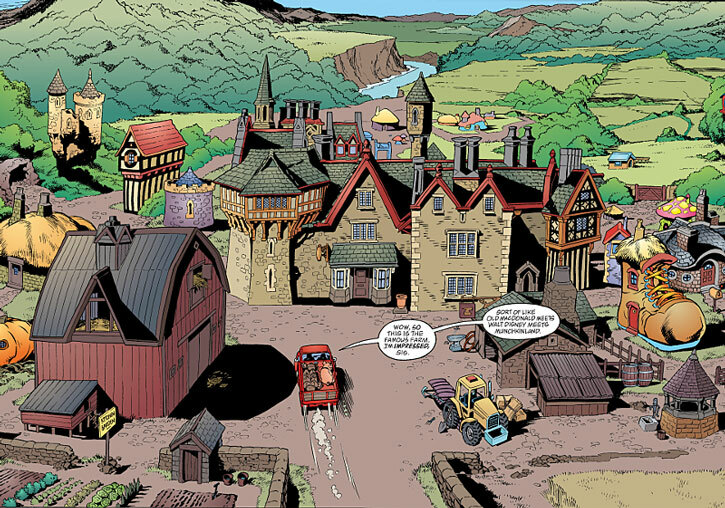 With his identity and the other intelligence gathered, Fabletown began covertly preparing for war. Preparations became more open, as willing fables were trained in combat. 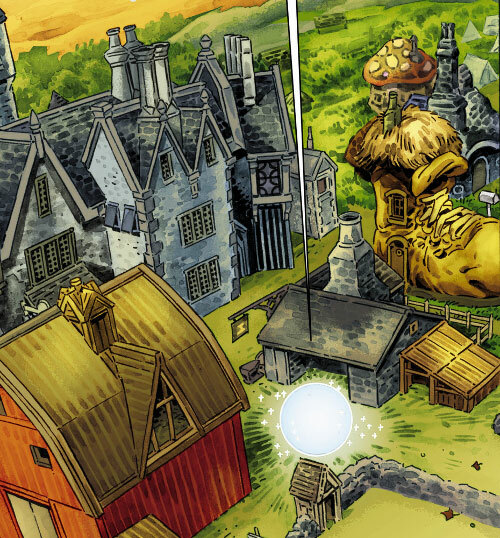 Alliances were formed with Fabletown East (based in Baghdad) and the Cloud Kingdoms which touched all lands. Bigby was also dispatched on a commando mission into the Homelands. There, he destroyed the sacred grove around Geppetto’s cottage from which his wooden children were carved. This soon brought the Empire’s embassy to New York to begin negotiations. But both sides knew these would never achieve anything. The embassy was led by Inquisitor General Hansel, a member of Fabletown before murdering his sister. Fabletown soon gained a new ally when Prince Ambrose (Flycatcher) underwent a quest to return to his homeland. Leading an army of ghosts, he established the small kingdom of Haven. Haven repelled increasingly large imperial forces. Eventually the Adversary sent an army of wooden soldiers, as Ambrose had foreseen. Ambrose used the last of his magic to transform the wooden soldiers into trees. That was a massive defeat for the Empire, and secured Haven’s safety from further attacks. With the Empire still reeling from the setback, Fabletown began setting their plans into motion. At first, they intended to wait until Geppetto visited the capital before commencing operations. But when Pinocchio returned from the Homelands with the locations of unknown portals to the mundy world, he bargained for his father being allowed to sign the Fabletown Compact. As a result, Prince Charming restored King Cole as Mayor while he became commander of the invasion forces. They began the war by sending in a blimp armed with modern weaponry. It was constantly resupplied by Boy Blue using the Witching Cloak to constantly move between the fronts of the war. The airship launched flying carpet-guided bombs at the portals linking the Empire’s worlds. While the Empire rushed to respond, the main strike came with the prick of a finger. Fabletown had snuck Briar Rose (Sleeping Beauty) into the Empire’s capital. The witches of the Thirteenth Floor had tinkered and honed her abilities so that her powers soon put the entire city to sleep, quickly overgrown by foliage. Over a million individuals were neutralised, including the heart of the imperial bureaucracy. Nevertheless, victory wasn’t easy. Imperial forces managed to bring down the airship before it reached the last gateway. Then the Emperor (the giant wooden soldier who acted as figurehead for the Empire) joined the forces laying siege to Bigby’s troops on the ground. Prince Charming was badly scarred by the airship’s fall. But he remained determined to complete the mission. He and Sinbad used flying carpets to drag a final bomb to the last gateway, where Prince Charming apparently died setting it off. The Fabletown ground forces were shaken when a magic arrow felled both Boy Blue and Bigby for days. They recovered in time for the Emperor’s arrival, and Bigby engaged him in single combat. The last of the imperial forces scattered after the Emperor’s fall. Casualties continued even after the war was won. Boy Blue succumbed to the enchantments of the arrow which had felled him. Neither medicine nor magic could help him. His death had sent Rose Red into a deep depression. It also created a religion – primarily among the Farm animals, led by Brock Blueheart (formerly Stinky the badger). These believed that Boy Blue would return to lead them into a golden age. Few were happy at Geppetto being allowed to sign the Compact, but this was soon overshadowed by another threat. The Empire had imprisoned many great powers over the millennia, using their power for its own warlocks. Without imperial forces to guard them, one of these powers was freed. Mister Dark had been the source of both the Witching Cloak and Witching Well used by Fabletown. With the Empire gone, he chose them as target of his revenge for use of his magic. Before reaching the mundane world he used his magic to shatter Fabletown. The first thing to go was the Business Office, the connection to its other-dimensional space severed. That meant losing Fabletown’s magic arsenal. Soon after came the collapse of Fabletown’s buildings. The fables retreated to the Farm as they sought to learn their new adversary’s identity. Geppetto tried to use the opportunity to regain some power. He swayed some of the more fearful fables with assurances he could deal with Mister Dark. His plans fell apart when Rose Red was pulled out of her depression. She quickly re-established her command over the Farm, and all the fables sheltered there. Frau Totenkinder, leader of the Thirteenth Floor witches, took the task of dealing with Mister Dark as her last. Reverting to her younger form, Bellflower, she travelled to the Homelands to learn what she could of Dark’s history. She located and recruited Dunster Hap, leader of the Boxers who’d confined Mister Dark. Returning to the Farm, Bellflower set in motion her plan to confront Mister Dark. They duelled, and Bellflower used all the magic she’d gathered over the centuries to trap Dark in gold. The prison didn’t hold. Not long after the fables explored the castle Dark had built over Fabletown’s ruins — with stronger magic that made the mundys ignore it — Dark broke free. Then he forced them to flee once more. This time Dark followed them to the Farm, forcing them to flee further – to Haven. Even there he managed to find them, laying siege to the kingdom and constantly pressuring its magical borders. Following Pinocchio’s suggestion, a super team was formed of their most powerful members. That was an attempt to harness the modern story format as a power source. They didn’t get the chance to face him, as Bigby’s father, the North Wind, challenged Dark first. They fought, and he dragged Dark with him into the Casket of Primordial Winds, ending them both. The threat lifted, the fables moved back to Fabletown. A smaller threat soon overtook them as fables were murdered in pairs. The first to die were Morgan le Fey and Mrs. Ford. With Bigby recently dead, and Beast now sheriff of Haven, Cinderella was assigned to investigate the deaths. The presumed list of other intended victims was found written by Mrs. Ford – who could foresee others’ dooms. Given the use of the car which was actually the transformed witch, Hadeon, Cinderella found its ability to travel anywhere still left her too late to save the next victims. These were Rose Red and Mrs. Moon, then Snow White and Edmund Dantes. Cinderella reached Bo Peep’s house before she or her husband Peter Piper were slain. But she found that the assassin had worn her guise when attacking them. Bo Peep attacked without warning, wounding but not killing Cinderella. The misunderstanding was sorted out, and Cinderella continued her search. Deduced the killer was Goldilocks, being manipulated by Hadeon. Identified the sword as one which forced the killer to take a second life for every one intended. Realised Mrs. Ford’s list was of those who would die rather than might. With their fates determined, Cindy had to let the killings continue. So died Bellflower and Dunster Hap, the Snow Queen and Ali Baba, Briar Rose and Prince Aspen, Beauty and the Lamia which had been part of her, and the Blue Fairy and the Lady of the Lake. Realising Goldilocks had likely travelled with her hidden by Hadeon’s magic, Cinderella took them to a barren world. She waited for Goldilocks to show herself and try to kill her. The fight was interrupted by Bo Peep, who’d snuck along at Cinderella’s request. Bo wasn’t good enough to beat the sword’s magic, and was its first victim. Cinderella, having realised she was on Goldilocks’ list but not Mrs. Ford’s, reasoned she’d survive the encounter. This (despite the unsteady logic) left the sword with only one second victim: Goldilocks. Cinderella took the sword from her and killed Goldilocks. Using the sword’s ability to restore one of each pair of victims to life if the wielder regretted it within seven days, Cinderella brought back Morgan le Fey, Snow White, Rose Red, Bo Peep, Bellflower, Briar Rose, Beauty, the Snow Queen, and the Lady of the Lake. Confronting Hadeon, Cinderella got her to admit her role. She forced her to take them to the lost Business office, from where she’d stolen the sword. The Thirteenth Floor witches re-established the connection with the Business Office. It was renamed Mirror’s House after the Magic Mirror who’d inhabited it for years. The Compact offers an amnesty against crimes committed prior to its signing. Therefore, old grievances are supposed to be ignored. While it doesn’t remove their memories, acting on them is a crime. It isn’t all-encompassing, and some exceptions have had to be made. For instance, Bigby was banned from Farm grounds due to his depredations against many of its residents in the past. Fabletown members are also constrained by certain laws, the most important being that they not reveal their true nature to mundys. Penalties for such are harsh – the general punishment options are community service or execution. Procedures are in place to deal with mundys who learn of their existence. Fables are not required to live in Fabletown, although most do at some point. Those who do are policed by the sheriff, while those elsewhere in the world are regularly visited by the Tourists (Mowgli, Feathertop, and the Woodsman). These are agents of Fabletown who travel the wider mundy world on various missions. Officially a democracy, Fabletown doesn’t have regular elections. But one may be called at any time if a challenger gathers 500 signatures in favour of a special election. 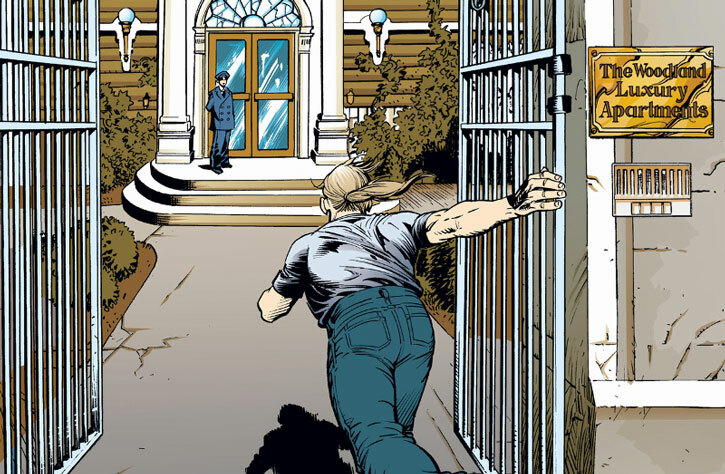 Fabletown’s sheriff has authority over internal and external security of the Fables community. Fabletown has so far had only two sheriffs: Bigby and Beast. The sheriff’s main responsibility is maintaining the secrecy of their true nature. He acts as judge in deciding punishments for actions which endanger this secret. Although citizens may appeal his decisions to the Mayor, the secrecy is important enough that his decisions are rarely appealed without strong grounds. If a mundy learns their secret, the sheriff takes whatever means are necessary to deal with the threat. Solutions include misdirecting the target, blackmailing them into silence, or, as a last resort, killing them. The sheriff may deputise any Fables required to get the job done. Under Bigby’s custodianship, the sheriff also became responsible for information gathering in the outside world, overseeing the activities of the tourists. He also employed Cinderella as an off-the-books spy, to work on any operation that he didn’t want known about. One mission was seducing the traitorous Ichabod Crane into confessing his willingness to ally with the Adversary. To fund his special projects, the sheriff has access to Gudrun, the goose that lays the golden eggs, whose escape from the Homelands is a secret. In DC Heroes RPG terms this effectively gives them Wealth: 012. The position also comes with (very) small office, next to the Deputy Mayor’s. 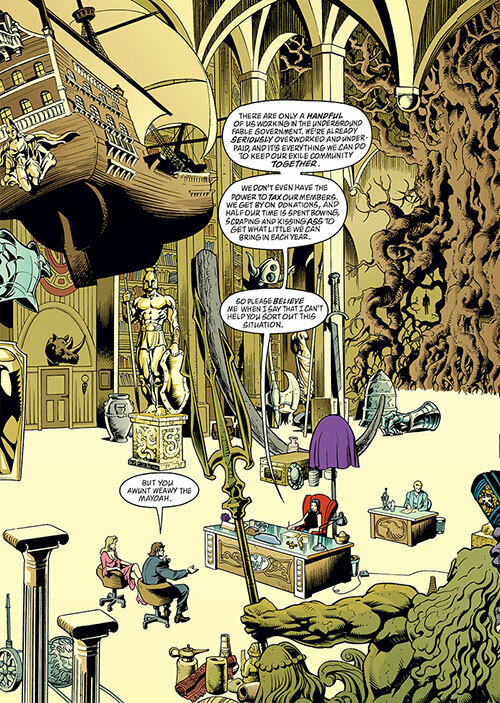 The Fables’ Homelands were once part of Dream’s realm. It’s unknown whether they separated from it some time ago, or, if not, why Dream does nothing to halt the Adversary’s Empire. The presence of super-powered individuals makes it easier to explain away any instances of their true nature showing, but they guard their secret just as closely. Fables can be hard to kill. The power of the stories surrounding them serves to keep them alive. Thus, the more popular fables able to survive even fatal wounds. Most known fables have a degree of Damage Capacity and Invulnerability, possibly even Regeneration. Lesser known ones just having Damage Capacity. Few Fables age. Relatively unknown ones have Slowed Aging, while the famous ones have the Near-Immortal Advantage. While the Power descriptions of Invulnerability and Regeneration aren’t explicit, for fables the Powers do not allow them to heal to above 0 BODY while still suffering a Killing Attack, such as drowning. This is true even if no RAPs of Damage are sustained that turn. With their durability partially linked to their popularity, these stats will fluctuate over time as the fable grows in popularity or diminishes into obscurity. Even the death of a fable doesn’t necessarily eliminate the role they play in stories. Another fable may appear elsewhere bearing a striking similarity. Prior to the Empire’s fall, all original Fabletown residents had the Forced Exile Drawback. Few have returned to their original homes since. The reasons are probably mixed – getting there may be awkward; they may still be controlled by the remnants of imperial power or other despots who’ve arisen; or they just don’t see that as home any longer. But their Exile is no longer Forced. 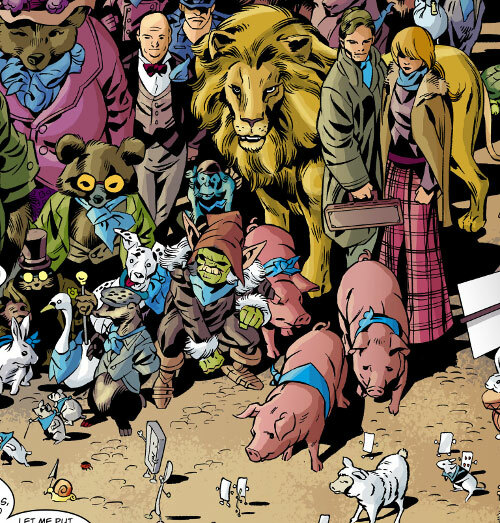 Source of Character: Fables (Vertigo). Writeup completed on the 8th of June, 2014.